The village is bustling with people due to the ‘Family Day’ events. Sasuke encounters Boruto, who’s been strolling along. When he hears about the new ‘Family Day’ holiday from Boruto, he reminisces about his childhood. 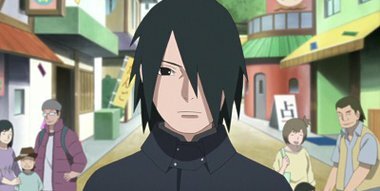 Sasuke then sets off to spend it together with Sarada. Even though Sasuke is trying to make his daughter happy, Sarada just feels embarrassed about him. Meanwhile, someone appears in front of Sasuke to suggest some help: It’s his former sensei, Kakashi!